The body is divided in two sections. 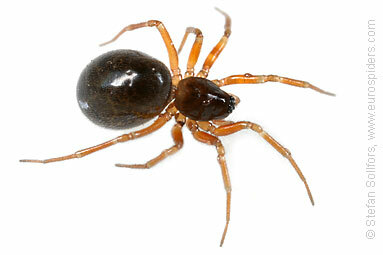 The front is called Prospoma (or Cephalothorax). The back is called Abdomen (or Opisthosoma). These two parts are connected by the thin pedicel. 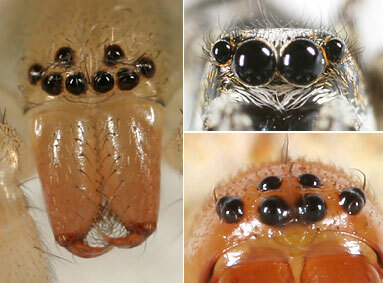 Most spiders have eight eyes, some have six. A few spiders outside Europe have four or two eyes. All spiders on this site have eight eyes. Spiders make silk from their spinners. On som spiders the spinners are big, on some small. 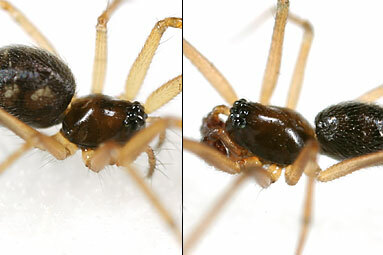 A few spiders (Hyptiotes paradoxus on this site, photo below, right) have a cribellum, a plate where the spiders produce thousends of thin silk threads at a time. Most of the time, the easiest way to see the if it is a male or a female spider is to look at the palps in front of the spider. 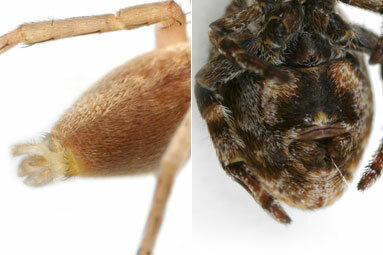 While the female palps are rather narrow, the male spiders have big palp ends that sometimes looks like boxing-gloves. These boxing gloves are used as pipettes to insert sperm when mating. To the left there are spider facts and photos describing what a spider is. From the menu on the left, you can also choose to have a look at spider relatives - Arachnids, and other small creepy crawlers that are not spiders. This will hopefully give you a better understanding of what spiders are.